The Canberra Press Gallery are unanimous — Macolm Turnbull had a terrific week last week. Managing editor Dave Donovan, however, is not in the Press Gallery. PRIME MINISTER MALCOLM TURNBULL had his “best week yet” last week, opined Barrie Cassidy on ABC Insiders on Sunday (18/9/16), as finely attuned as ever to the prevailing media narrative of the day. And he was right, according to Canberra Press Gallery, Turnbull did have a great week. But why did the mainstream media, speaking as one, say Turnbull had such a “super week”? Well, because he got two pieces of legislation through the Parliament —the so-called Omnibus bill and some changes to superannuation laws. Of course, neither of these bills were anywhere near the same as the ones the Turnbull Government took the election. The ones the Government said were “ironclad” promises and unable to be negotiated. Promises, schmomises, said the Press Pack, master negotiator Turnbull negotiated them both through Parliament with the Opposition and his own unruly backbenchers — and that’s all that matters. Well done, Malcolm, koala stamp for you. Yes, apparently we don’t worry about backflips or broken promises anymore. I’m sure Julia Gillard will be looking on at this turn of events with some bemusement. Neither of these modest measures have improved the budget bottom line much and certainly not beyond what was taken to the election. But, nevertheless, they are a triumph according to the monolithic Canberra Press Gallery. Apparently, the Turnbull Government getting anything at all through Parliament – as opposed to losing votes on the floor of the House, as happened the previous week − is now to be seen as a stupendous achievement. Things had not been going well for Malcolm up until this point – approval ratings sliding and beset upon by all sides, including his own. But that’s all changed, as the Press Gallery have now reset the bar so low for Malcolm, a snake could stride over it. Isn’t it nice to have friends? And maybe Malcolm will also be seen as having a great week this week as well, what with him addressing the United Nations General Assembly in New York and pressing the flesh with other world leaders. However, soon he will have to come back to Australia, where there are big battles looming and problems for Malcolm aplenty. For one thing, he has wasted substantial political capital pursuing an unpopular and expensive plebiscite on marriage equality. He will almost certainly not get that bill through parliament, what with Shorten signalling the ALP will oppose it. This will be an embarrassing defeat for Turnbull. What then? A vote in Parliament on the matter? If that were to occur, after all that’s been said, the prime minister would look like an utter fool. Even more problematic for Malcolm is George Christensen, who got his way over superannuation changes and, thus emboldened, has now threatened to “leave the Coalition” over the Scott Morrison’s absurd backpacker tax. This threatens Turnbull’s majority on the floor, meaning he will almost certainly cave in to Christensen again — either watering down the legislation or abandoning it entirely. Another embarrassing backdown, though of course the Press Gallery will probably sell it as another example of Turnbull “innovation” and "agility" (god help us). In fact, this will be more confirmation Turnbull does not run his own Government. … with a majority of only one, an unpopular Turnbull Government some time in the future could even be ended by a backbencher with a grudge. For example, a disgruntled backbencher could at some stage in some hypothetical future, side with Labor and the crossbenchers in a vote of no-confidence in the prime minister on the floor of the House and so bring down a shaky Turnbull Government. It is possible. Of course, you may well say, no self-respecting "Australian Conservative" would ever do this and help to bring in a Government of equality-seeking socialists, but it is certainly a bargaining chip every power-hungry backbencher would hold in his or her hands, giving these MPs immense personal power over Turnbull. With a two seat majority, this bargaining chip becomes next to worthless. 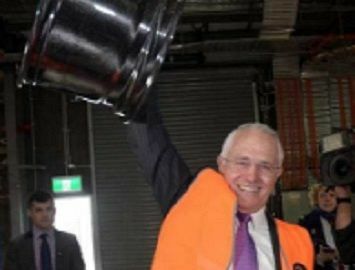 With a one seat majority, Turnbull is on the edge, at the beck and call of every backwater conservative seeking to nobble, frustrate and foil him. In short, Turnbull's situation is not tenable. Turnbull is both beholden to and despised by the ultra-conservatives in his own party, many of whom would be much happier in the embrace of Pauline Hanson’s One Nation party. Last week, we saw Turnbull will buckle to them. And unless Turnbull finds some way to escape their trap, such as calling an early election almost immediately, they will break him to their will time and time again. Until his authority is gone and he is bowed and broken. Last week was not a strong week for Turnbull. In fact, it was a weak week that showed, yet again, how tenuous his position truly is. George Brandis says Turnbull could become a great prime minister — as great as Menzies, no less! Well, in Menzies’ first incarnation as prime minister, he was toppled after just two years in power. And as was that other grandiloquent barrister, Turnbull is likely to be gone before too long. Beware the Ides of March, Malcolm, because the daggers are being sharpened. You can follow Dave Donovan on Twitter @davrosz. Read about how IA was unfairly shut out of the Canberra Press Gallery in Independent Australia's exclusive Members' Only Area. Step outside the echo chamber. Subscribe to IA for as little as $5 a month.